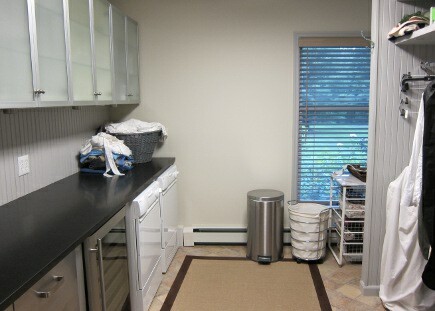 I know my laundry room is eccentric but I like it and it feels finished. We’re just past the first year of living in our house full time. Everyone says it takes years to settle in but what’s odd is how some rooms wear well others just bug me. The powder room has led three lives and I’m not ruling out a fourth. This week, I couldn’t stand the laundry room for one more minute. It’s always had the classic Farrow and Ball Pavilion Gray beadboard and trim (my perfect gray) but something felt wrong. Finally, I realized the backsplash needed to be the same color as the counter: black. 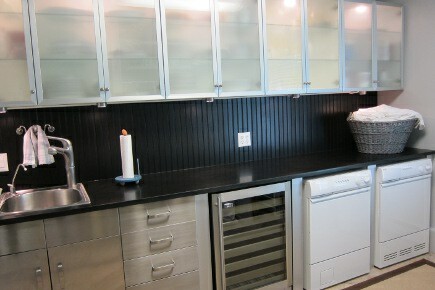 Who has a black counter in a laundry room let alone black beadboard? With lint, it’s nuts, right? 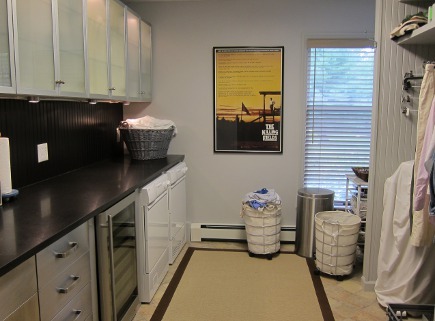 But my laundry room multitasks as a butler’s pantry, wine room, utility room and mudroom/entry from the garage. Sometimes, it’s the first room in the house a guest sees. And I was stuck with a 14-foot-long absolute-black granite counter that’s been next to bulletproof. Ten years ago there was little choice with only one stone fabricator in 50 miles and it seemed fine with stainless-front Ikea cabinets in a weekend house. The laundry room measures 14 x 10 so it’s not as large as I’d like. 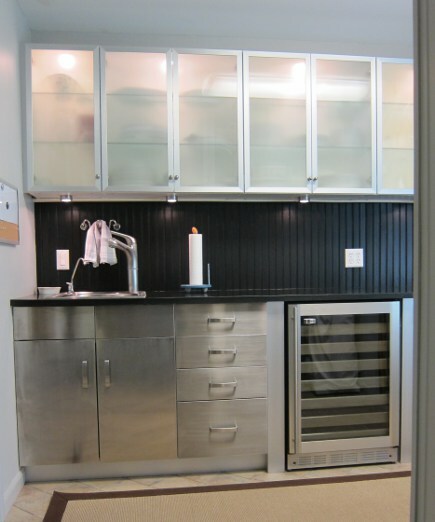 It houses a lot thought: a sink, utility drawers, wine refrigerator, front-loader washer/dryer, glass front cabinets for dish storage, an open closet, laundry-drying hooks, plus an ancient Elfa wire drawer unit (partly hidden by the closet) topped by a piece of marble from 4 kitchens ago. Here it is with recent changeable taupe wall color (Farrow and Ball Shaded White) the day before I painted. Oh, and notice the big window, which adds up to one heavily used, chopped up room that lacked focus not to mention accessories. The wall color has never been right. Early on it was off-white. In her book, The Private House, California designer Rose Tarlow observed that “Eccentricity in design is unique and special only when it comes from within you, sometimes unintentionally, quite often irrationally, and always for the right reasons.” Thank you Ms. Rose. Once I had the notion of unifying the counter and backsplash color, I found the “right reason.” Then, painting the laundry room walls the same gray as the woodwork became part of my unification strategy, so I tackled that first. Fortunately, I had nearly a gallon of leftover Pavilion Gray Eggshell paint in the basement. I didn’t have any black paint in the house and, while I’d normally use F&B, I grabbed a quart of satin-finish black paint at the hardware store. Fortunately, that matched the sheen of the honed granite. 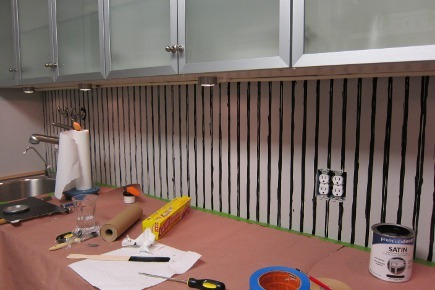 Beadboard is not easy to paint because of the curves and grooves. To get it right, I first went over the “beads” with a detailing brush. Then I painted the flat sections with a first coat, which proved to be quite streaky because the paint was relatively thin (at least compared to F&B which almost has a pudding like quality). I let it dry and painted a second coat, then touched up any spots I’d missed. After I finished the whole job (which included touching up the ceiling which I somehow managed to mark in a couple of places with the gray paint), Mr. AM came to see the results. “Has that always been there?” he asked, pointing to the Michael Graves towel rack over the sink. The answer was “yes” but without the contrast of the dark background the charm of the playful shape had been as invisible as the backsplash itself. Two days later, per Allison’s comment (below) I hung up a movie poster from our apartment home office (which had been in the basement). That went on the far wall and it helps pull attention away from the awkwardly placed window. The poster looks neater than laundry hanging from a hook (a brief thought) as I have the hanging space for that. Plus, the poster makes the room feel finished, at last. Great project. I wouldn’t have thought of using the dark paint. Did you spray paint your laundry basket? I was going to suggest a large framed poster on the wall. Let me know what kind of hook rack you’re looking for and I’ll keep my eye out too. Yes, I did spray it a while back. It’s on its last lap but it’s better looking than plastic. I had thought of a large poster and we actually have one downstairs that would work size-wise. Art would look better but renders the wall space unusable. I love it Jane: it’s SMART. never saw the beadboard painted black! I like it! I’ve only seen it in a bathroom we featured: https://www.atticmag.com/?p=15688 but it’s a very different look. I wasn’t really sure about it until I had painted the area behind the sink. But I trusted my instinct, figuring that I bought the paint quickly (when I buy without thinking it’s usually right). 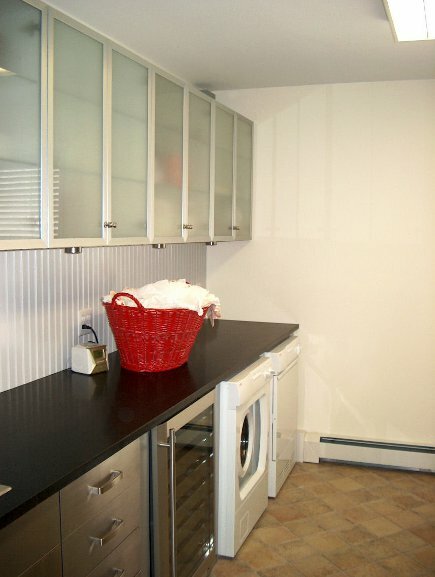 Such a great room to do laundry in! I love the beadboard painted black! Thanks so much for stopping by my blog. It works here, Jane! I know very well about this being an entry into the house that many guests see this area first. I had to keep that in mind when we fixed up our laundry area/mudroom/garage entry. For a small space it serves many purposes, so it makes sense to have it all look cohesive. 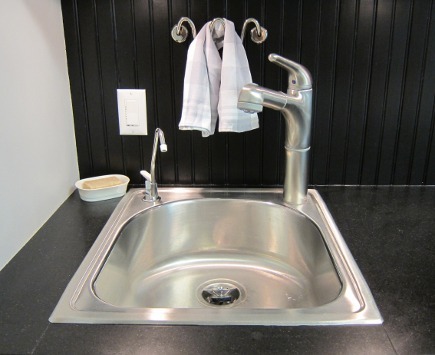 You’ve got some great counter space here and I’m sure it really comes in handy. I like it! It looks great. 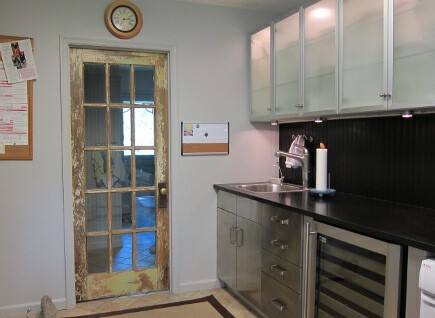 Are you going to paint the glass-paned door black, too? It might look good. Funny you mention the door Lisa, as I had a brief thought about painting the woodwork black in that room but decided it would look too Goth. But not the door as it’s salvage, from the 1930s. We have a dozen of them throughout the house and I spent 3 months scraping them during the reno. But I have a line-up of furniture to paint. And how’s this for a scary amount of paint in one basement? The gray was more utilityish and the black is so much sharper and more elegant for the room’s other purposes. Good call. better with the black for sure.